A solstice is an event occurring when the Sun appears to reach its most northerly or southerly excursion relative to the celestial equator on the celestial sphere. Two solstices occur annually, around June 21 and December 21. The seasons of the year are determined by reference to both the solstices and the equinoxes. 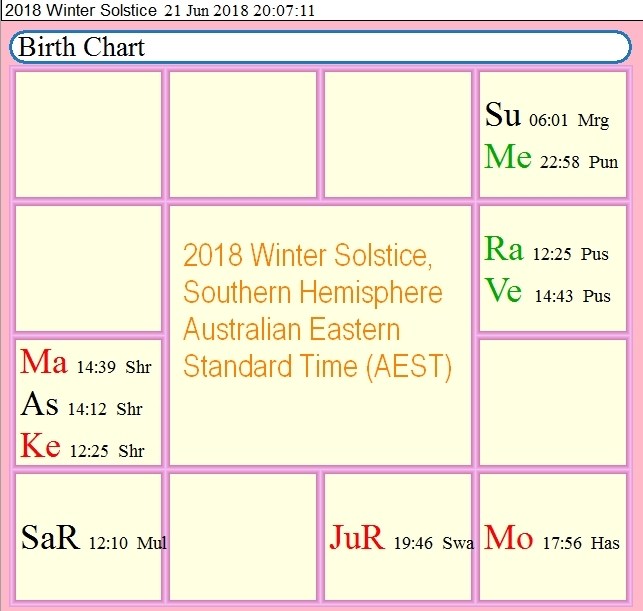 In the Southern Hemisphere, the winter solstice for 2018 will occcur at 8:07pm on the evening of June 21st. ‘Solstice’ (Latin: ‘solstitium‘) means ‘sun-stopping’. The point on the horizon where the sun appears to rise and set, stops and reverses direction after this day. On the solstice, the sun does not rise precisely in the east, but rises to the north of east and sets to the north of west, meaning it’s visible in the sky for a longer period of time. Although the June solstice marks the first day of the southern astronomical summer, it’s more common to use meteorological definitions of seasons, making the solstice midsummer or midwinter, as it is in the case of the Southern Hemisphere. An inauspicious period for undertaking Sadhana. Those who pass away in the other half of the year, during the Dakshinayana, when the sun moves southward, have the opposite destiny to Uttarayana; then the heart is beset with smoke and fog and cloud. This is the meaning of the expression, Krishna-Paksha. Those who die at such inauspicious time reap an inauspicious result. During the second half of the year, when the Sun moves southward. The Sun is then hidden and his effulgence has no splendour. During the dark half of the month, when the Moon wanes, symbolising the waning of God-ward thoughts. From the chart above, the lagna and two planets – Mars and Ketu are all in Shravana Nashatra. Shravana nakshatra is lorded by the Moon, the presiding deity of the mind. The symbol for this nakshatra is the ear, which indicates that concentration and stillness of mind are necessary to hear the voice of the one who is the deity of this nakshatra, Sri Vishnu. The other symbol of this nakshatra is the Three Footsteps, indicating the Vamana avatara of Sri Vishnu, who asked (Mahabali) King Bali for three footsteps. Immediately prior to this request, King Bali’s guru, Shukracharya, warned King Bali not to grant any requests from the dwarf-sized Vamana. King Bali failed to listen, ignored his guru’s request and hence, was consigned to the underworld, only to emerge each year on the anniversary of Onam, in Shravana Masam. Listening is important: the key to understanding “guru” is that it is made up of two syllables, ‘gu’ which means to sit near, and ‘ru’ which means to remove the darkness from. King Bali failed to heed the words of his guru, and remained in darkness and ignorance. He did not recognise the dwarf-sized Vamana as avatara of Sri Vishnu, where Guru Shukracharya did. The lagna is hemmed in by Mars and Ketu, both of which are malefics. The Ascendant is also afflicted by the Rahu-Ketu axis; however, Mars is a Kendra lord indicating that Ketu is capable of raja-yoga. It remains to be seen if the raja yogas will fructify; much depends on dasha and bhukti periods for individuals. Mars and Venus are in the Rahu-Ketu Axis. The Venus/Mars aspect one to another generates attraction, sexual energy and enthusiasm for interaction and relationships of all kinds. The Rahu-Ketu axis reminds us that there is past karma present in our relationships (Ketu is the karmic reservoir, Rahu is the dispositor (giver) of karma in the present situation.) This can give rise to some negativity and/or disturbance in relationships. Ketu is with Mars which only magnifies the energy of Ketu. So we keep in mind that while this is occurring at the time of Solstice, it will also lend a flavour, an undercurrent to our relationships over the next six months. It would be best if we apply the golden rule to all our relationships – that is – do unto others as you would have them do unto yourself. We have given mention to the Ascendant (rising sign) being in the Rahu-Ketu axis. The lord of the Ascendant – Saturn – is in the 12th house at the time of the solstice, indicating that losses, confinement, hospitalisation and restriction of desires and ideas will be at the forefront of many minds. It is a time of learning karmic lessons with patience and good cheer. Although we may be having a less that satisfactory inner experience, it behooves us to keep our miseries out of the ethers and be of good cheer and show a cheerful face to the world. Problems are like passing clouds. They are here today (thank you Saturn, thank you Rahu for smoke and clouds) and gone tomorrow (thank you Venus). Passing clouds do not indicate the foundation of our lives, they are just the third density karmic lessons we signed up for in the human experience. The placement of the Sun in neutral Mercury’s sign Gemini (the sixth house, house of disease, argumentation and narratives of service) along with Mercury indicates that argumentative narratives will be witnessed on the world’s platforms in the coming half-year. We have just seen the resolution of separating families from Mexico, and the important cessation of unnecessary – needless – suffering brought on by bureaucracy. This was a time of high repetition of arguments, defences and world-wide response on social media. 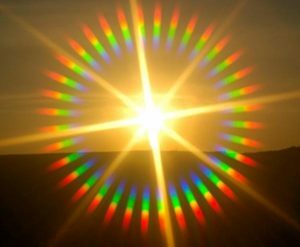 Such matters are brought to light by the Sun in the sixth house. The light must shine in dark places. The presence of the Sun in the sixth house elicits father-narratives. The conflict narrative of argument, ailment, injury, accusation and pollution exists in the rights of women to be treated with dignity and not expect to visit personal violence in any sphere of their activities. This is the role of Mercury, messenger of the gods, reminding one and all in this time of #MeToo that the soul is androgynous, and the gender role taken up is not the pointer of suppression of one gender over another or even transgender – since Mercury is the protector of these types also. We can expect to see a prolonged time of revisiting women’s rights on the world stage for the foreseeable future. Neptune is transiting in sidereal Aquarius from April 24, 2008 until February 18, 2023 and has recently stationed at 22° Aquarius and is retrograde until November 25. If you have anything afflicted in your birth chart in sidereal Aquarius around 19-23 degrees, or anything afflicted around these same degrees in sidereal Taurus, Leo, or Scorpio, then you will be revisiting matters from the past and either learning lessons again, or confirming matters in the past as a foundation of strength for the future. For people over the age of 50, we look to the Navamsha chart (9th harmonic); here Neptune is conjunct Ketu around 21°24′ in Aries in Bharani nakshatra. Mercury is also in the conjunction in Krittika nakshatra at 26° Aries. It is important to be grounded at this time and not to take communications for granted. Communications may be interrupted – and interruptions may cause one or another to see red. The interruptions require us to be patient, to be grounded and not caught up in personal delivery or inner narratives. A Neptune-Ketu conjunction may have some living with delusion or fantasy about the outcomes of actions. Fortunately there is a glance or drishti from Saturn. When Saturn does things, it takes a long time and things get done well and properly. Allow time, allow time to be peaceful, and allow the glance of Saturn to bring protection from rash actions or choices. On this, the longest day of the northern year, the sun never sets at the Arctic Circle. It loops around, kissing the northern horizon and casting an otherworldly orange glow before rising again.